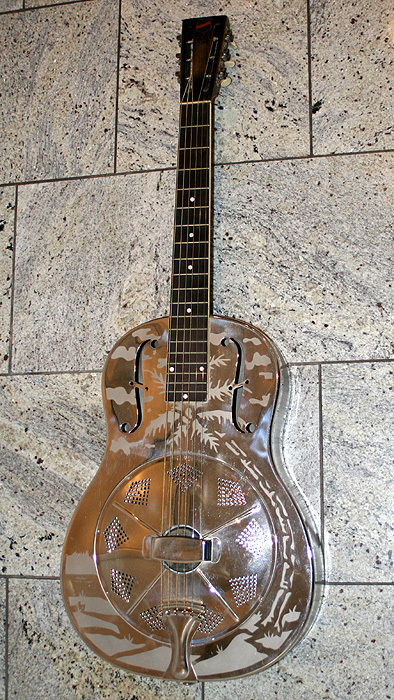 What can be nicer than one of those wonderful old National resophonic guitars like the Style-0? The answer is, of course, two of these! My friend Thomas brought his 1932 Style-O along for a photo session. And what a wonderful guitar this is – shiny and sparkling like one of the new reissues but real vintage, almost 80 years old. The pictures from the photo session show the guitar from all sides, and some in contrast to my battered-looking 1936 Style-O. The National Style-0 from the early 30ies have a different, longer body shape. 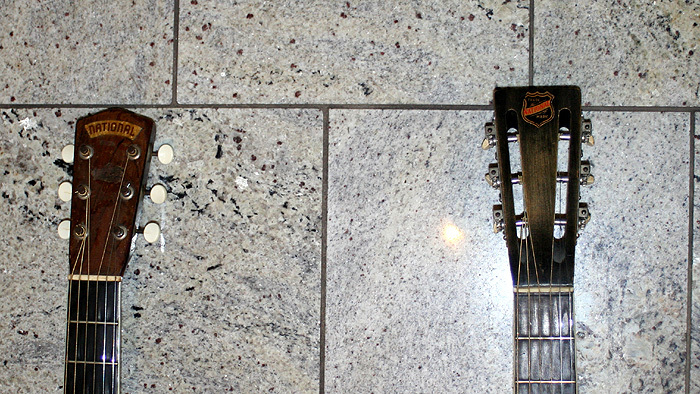 The body joins the neck at the 12th fret, while from the mid-30ies on the joint was near the 14th fret. For this reason the body was slightly larger, and thus has more volume. In fact Thomas’ National sounds deeper and has more low end than the 1936, however, you never know in how far the sound difference is caused by other aspects. 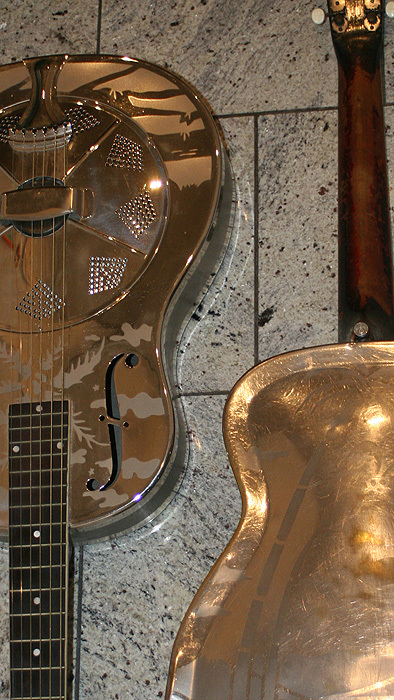 One is that on his 1932 the resonator rests on a ring of thin rubber foil. 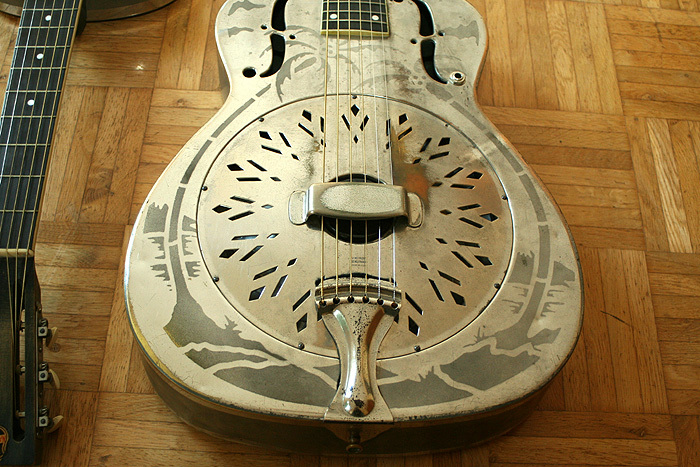 This was done by a luthier some time ago to remedy buzz from the resonator. 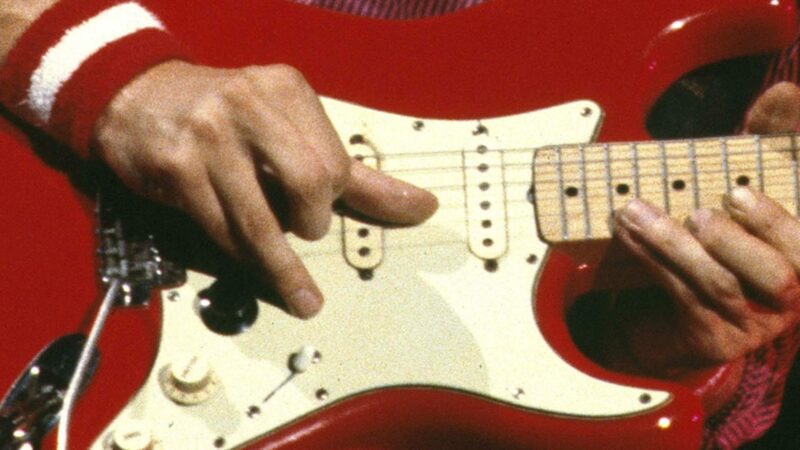 Both guitars differ a lot in detail, e.g. 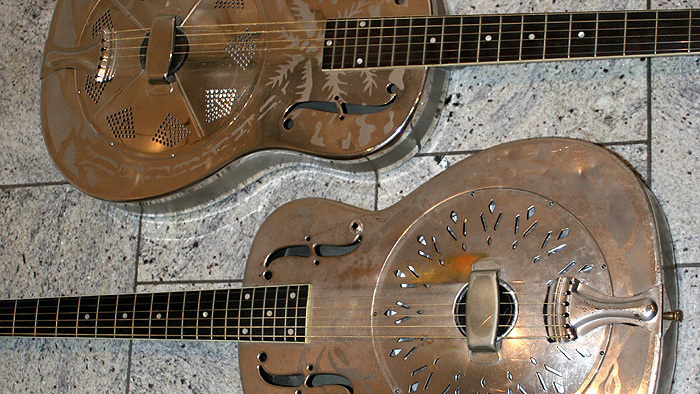 different resonator covers, different logos, different headstocks, etc. The pictures might tell more than many words here. 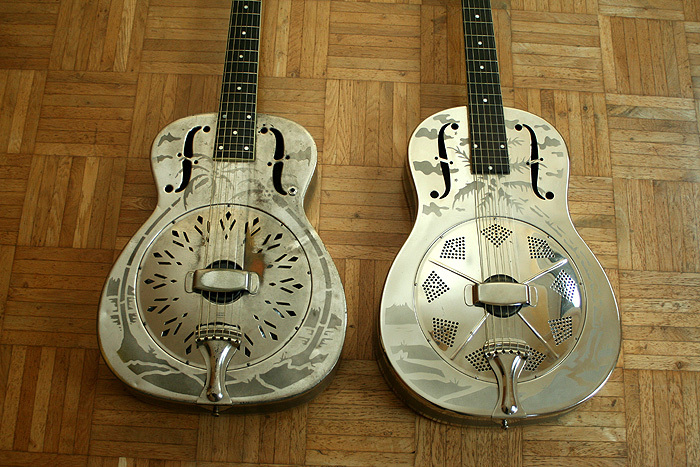 The 1932 has a flat fingerboard while the 1936 is curved. 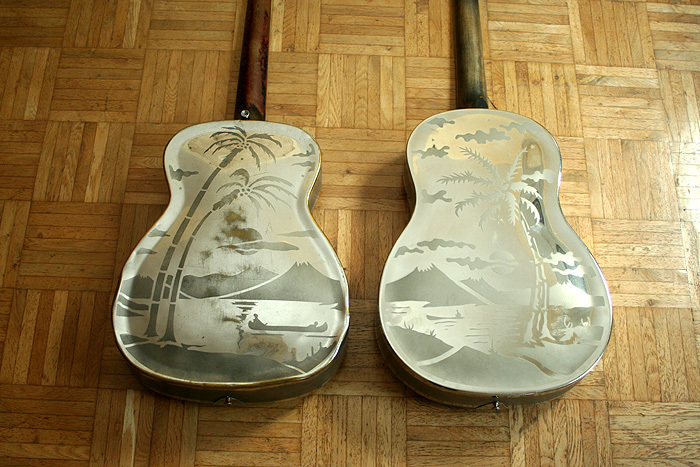 Both have the original frets, but in case of the 1932 these are heavily worn, especially in the middle of the frets so that the frets appear almost concave which makes it unpleasant to fret certain chords. The 1936 has an extremely fat neck, the Shubb capo can be used only up to to the 5th fret and does not fit anymore beyond this point. 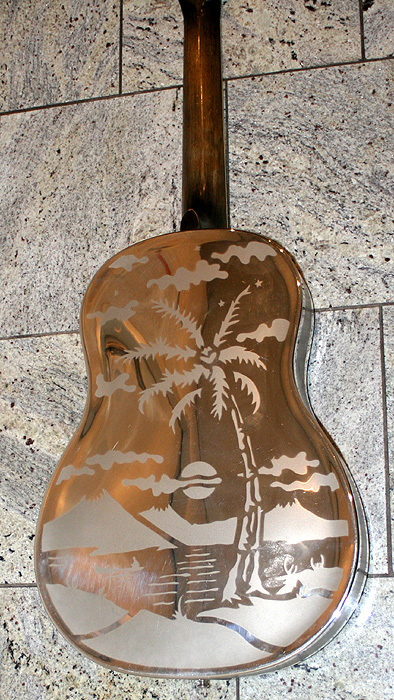 Both have the Hawaiian scene with a volcano, a canoe and the palm trees on the back, but both are different. National used many different variations over the years. May i ask you ” the hight” on the bridge? I read the article on the highlander pickup where you used a saw and a file to make the new bridge fit. 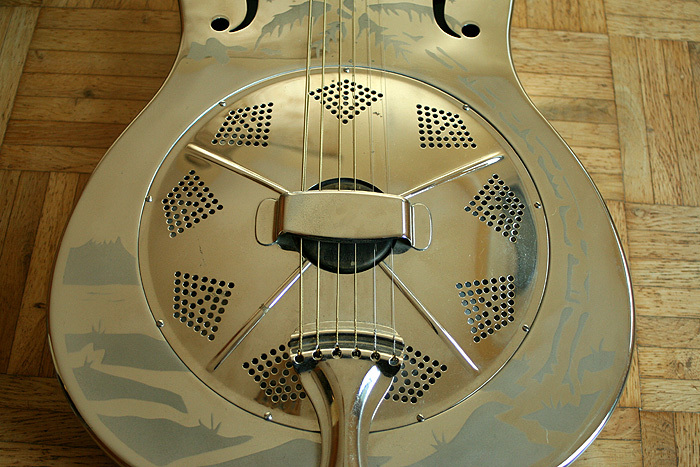 I am curious because I think the bridge is to high on my resonator. I have a 1932, 8/10 condition how much would it go for?